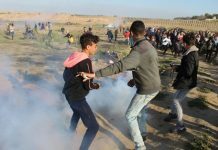 Despite clashes between Palestinian civilians and the Israeli occupation forces in the occupied Palestinian territories significantly decreasing, the Israeli occupation forces have continued to perpetrate serious abuses against Palestinian civilians, including shooting at the civilians and shelling residential neighborhoods. 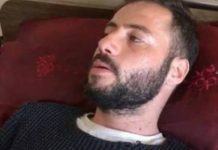 This afternoon, at about 14:30 local time, the Israeli occupation forces continued their widespread human rights abuses when they killed a 12-year-old Palestinian child with a live bullet in the neck. 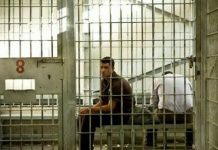 Yesterday evening, a young man from Al-Boreij was shot dead by Israeli occupation forces with a live bullet in the head. 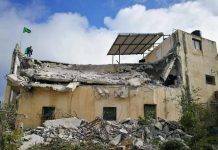 The Khan Yunis refugee camp was shelled from military posts and by tanks of the Israeli occupation forces in the vicinity of Al-Tuffah roadblock and Neve Dekalim settlement. In the past 24 hours, the Israeli occupation forces have continued to sweep agricultural land and to demolish civilian facilities in Al-Qarara, in the middle of the Gaza Strip. This afternoon, 12-year-old child Mohammed Sleh Mohammed El-A’rja, from Rafah, was shot dead with a live bullet in the neck by the Israeli occupation forces. 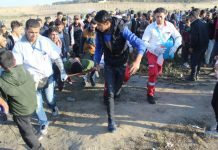 PCHR’s field officer in Rafah reported that the child was playing near his house adjacent to the Palestinian-Egyptian border in Rafah, when a soldier of the Israeli occupation forces shot him dead from a great distance at about 14:30 local time. The child was evacuated to Nasser hospital in Khan Yunis, where was pronounced dead. This grave human rights violation is another to be added to the record of willful killings committed by the Israeli occupation forces against Palestinian civilians, including children. Near Al-Mentar (Karni) Outlet, to the east of Gaza City, the Israeli occupation forces shot at a number of Palestinian young men, who gathered about 150 meters away from these forces, which were reinforced with tanks on the main road between the area and Al-Shuhada’ (Netzarim) junction on Salah El-Din Street. As a result, a young man was wounded with a live bullet in the foot. He was evacuated to Shifa’ hospital in Gaza City. In Khan Yunis, this morning, the Israeli occupation forces shot at Palestinian civilians, wounding one, despite there being no clashes at the time. PCHR’s field officer in Khan Yunis reported that this morning, at 9:30 local time, Israeli occupation troops positioned in the vicinity of Gadid settlement, in the southwest of Khan Yunis, shot at two Palestinian young men who were more than 150 meters away from the military post. As a result, Karam Mustafa Jadallah, 17 years old, was wounded with a live bullet in the foot. He was evacuated to Nasser hospital in Khan Yunis city. 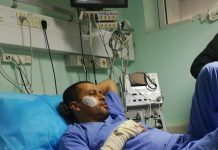 PCHR’s field officer added that shooting by the Israeli occupation forces at Palestinian civilians, even when there are no clashes, is a daily occurrence. These forces are a source of permanent threat to the safety and security of Palestinian civilians. The house of Mustafa Mohammed El-Doush, an asbestos-roofed, one-story house in which 11 people live. The roof, walls and furniture were partially destroyed. The house of Khalil Hassan Farahat, an asbestos-roofed, one-story house in which eight people live. The roof and water reservoirs were partially destroyed. The three-story house lived in by Fayez Oudeh Abu Akker. A shell penetrated a wall of the second floor, hitting the children’s room and destroying windows and furniture. 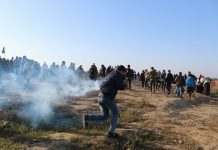 Yesterday afternoon, the Israeli occupation forces shot at Palestinian civilians, who demonstrated more than 150 meters away from a military post of these forces, to the east of Al-Boreij refugee camp. These forces shot at Palestinian civilians, killing Ismail Abdel-Salam Abu El-Rous, 20 years old, with a live bullet in the head. PCHR’s field officer reported that the shooting took place when Palestinian young men did not pose any threat to these forces. He added that a sniper of the Israeli occupation forces shot with the aim to kill. No other injuries were reported. A one-donum area of agricultural land on which a greenhouse planted with vegetables was established, owned by Joma’a Mosallam El-Semeiri. A four-donum area of agricultural land planted with olives, owned by Abdullah Abu Meghasib. In addition a well, a water reservoir and a store of agricultural equipment were destroyed. A five-donum area of agricultural land planted with olives, owned by Suleiman Abu A’mra. A four-donum area of agricultural land planted with olives, owned by Mohammed El-A’ttar. An eight-donum area of agricultural land planted with olives, owned by Ahmed Hussein El-Semeiri. An eight-donum area of agricultural land planted with olives, owned by Ali Salameh El-Semeiri. A nine-donum area of agricultural land planted with olives, owned by Hussein Suleiman El-Semeiri. A six-donum area of agricultural land planted with vegetables, owned by Yousef Suleiman El-Semeiri. In addition, a water pump and an irrigation network were destroyed. A four-donum area of agricultural land planted with olives, owned by Suleiman Hussein El-Semeiri. A 20-donum area of agricultural land planted with olives, owned by Abed Ahmed El-Farra. A two-donum area of agricultural land planted with olives, owned by Abdel-Qader Abu Meghasib. A four-donum area of agricultural land planted with olives, owned by Abed Joma’a El-Semeiri. A 20-donum area of agricultural land planted with olives and almonds, owned by Abed Rabbo Ahmed El-Semeiri. A two-donum area of agricultural land planted with olives, owned by Abdel-Rahim El-Semeiri. A six-donum area of agricultural land planted with vegetables, owned by Zayed El-Semeiri. A two-donum area of agricultural land planted with olives, owned by Mazen El-Semeiri. A two-donum area of agricultural land planted with olives, owned by Suleiman Ahmed El-Semeiri. A 12-donum area of agricultural land planted with olives and vegetables, owned by Shukri Abu A’mra. A bird farm established on a 100-square-meter area of land, owned by Medhat Khattab. A 150-square-meter, one-story house owned by Rae’s Suleiman El-Semeiri. A 120-square-meter, one story house owned by Ibrahim Suleiman El-Semeiri. In addition, a water pump, a pool and a room of agricultural equipment were destroyed. Establishing without delay an independent commission of inquiry, in accordance with UN Security Council resolution 1322 (2000), to carry out a thorough and comprehensive investigation into the abuses and killings perpetrated by the Israeli occupation forces against Palestinian civilians. Convening a conference of the High Contracting Parties to the Fourth Geneva Convention of 1949 to ensure Israel’s compliance with its obligations under the Convention. Immediately providing international protection for Palestinian civilians in the occupied Palestinian territories in the face of the killings and criminal acts perpetrated by the Israeli occupation forces and groups of Jewish settlers who move under the protection of these forces. Use by the EU of effective political and economic measures with reference to Article 2 of the Euro-Israel Association Agreement, which calls for the respect of human rights. Providing humanitarian and medical assistance for the Palestinian people whose living conditions are increasingly deteriorating because of the continued total siege imposed by the Israeli occupation forces on the entire occupied Palestinian territories. Use by the international community and relevant bodies, including ICRC, of necessary measures to ensure the access of medical supplies and equipment and other humanitarian assistance to Palestinian civilians. The Israeli occupation forces have continued to deny entry of this material through Rafah Border Crossing (into the Gaza Strip).